Oh, it was so nice to hear the rain falling this morning that it almost made up for all of the noise the kids were making throughout the house. The boys, who we heard stomping down the stairs at 7:01, were pretty rowdy as they sat on the couch playing football on their kindles. Soon everyone but Keaton and Whitman were awake. Robby made cinnamon rolls and really before we were able to do anything on our list, it was time to get dressed and leave for the day. The early afternoon at Nonna's house while Robby and I worked at GS Fest. We worked for the concessions and since the weather had scared most people off of GS Fest the crowds were light and so we didn't have a whole lot to do. The original Dennie plan had been to bring the kids after we worked but the weather had been threatening so we brought them last night and I kicked myself all afternoon-they could have rode ride after ride today. Robby suggested having Pops bring some of them but they had shorts and no jackets so that wouldn't have worked. They had a blast last night though and that was enough to last them for a while. After Robby and I finished our shift, we went and rode down the slide before picking up the kids. We were only home for a bit and then it was time to get dressed for our Halloween evening. 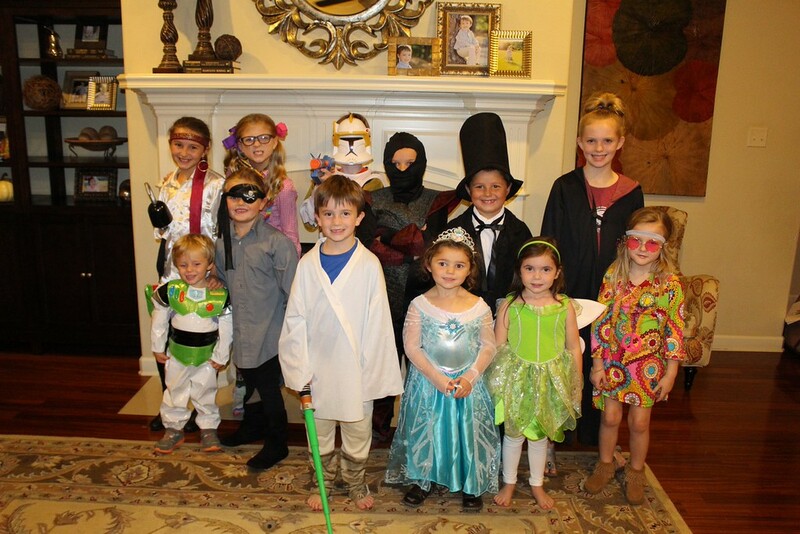 The kids have not had quite a bit of practice getting into their costumes so it didn't take them long at all to throw them on and head out the door. The first stop was Grannymom's house and she was passing out big candy which started their night off right. Then right down the road to see Lilli and Cash and on to Sonic for 50 cent corndogs for supper. Next up was Nonna's house and we stopped by a few of her neighbors before heading to our main event. The Browns had popcorn, candy and cotton candy and my people could not wait to get there. We hit quite a few houses in their neighborhood. The kids were troopers and carried their heavy buckets and walked and walked without too much complaining! Whitman spent most of his time in the wagon eating the candy that he had just gotten from the house before. If he saw a lollipop in house's candy bucket, he would reach in and grab it, try to sit on their porch so he could open and eat that candy! Once at home, everyone neeeded showers and then they spent some time sorting and looking at their loot. We let everyone have one more piece of candy and then bedtime. Breakfast this morning was all fruit-apples, grapes, strawberries, mandarin oranges and even raisins. Goodness though, I did forget to pull out the applesauce. Anyway, this fruity breakfast pleased some people and did not please others at all. The kids had worked a bit on today's school on Wednesday and yesterday so they had much less than a normal day. But Graham was the only one finished around 10 or bit before. We didn't have much extra time built into our day so the others just had to stop working since we had something more important to do. In the attic in the bonus room, Robby hung a few pieces of sheet rock and it was a perfect place for the kids to paint. But it had been so hot this summer that we never got around to it and we almost waited until it was too cold. The kids all lined up and everyone had their own space and they painted away. It was pretty interesting to watch them paint-Reagan could have painted for another hour and Whitman was finished in a few minutes. Anderson meticulously painted the solar system while Graham just did a "messy painting"-his words. Campbell copied off Reagan which upset Reagan so Campbell changed hers and Keaton did not want for her paint to mix at times and at other times she would smear it all around on her plate before painting anything. This activity took us to lunch time which was the start of our next activity. A few days ago Reagan's reading was a recipe that she then had to answer questions on. She wrote on the top of the page when she turned it in that she wanted to make it sometime. So for lunch we made pancakes-this is probably my second time to make them but with the kids help, they turned out pretty good. Actually they were good enough that we all ate 2 full recipes of pancakes. The kids had time to finish their school work while I straightened for a bit. 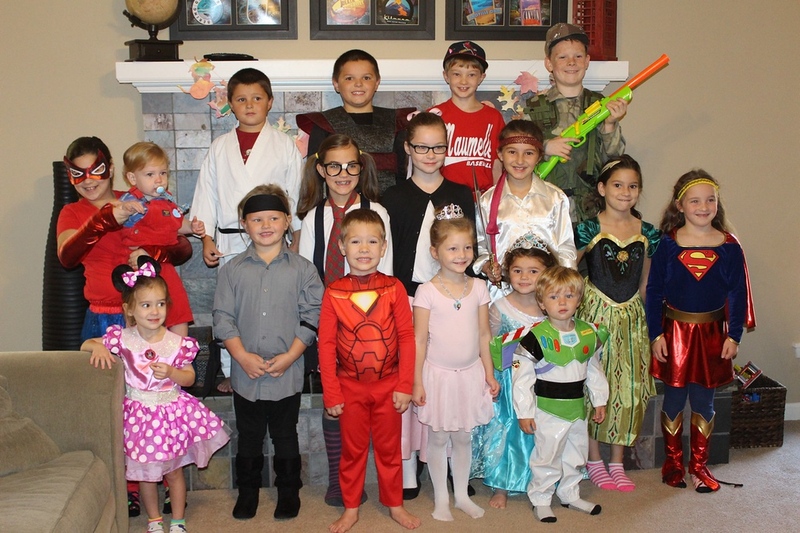 Then everyone donned their costumes and we headed out to the fall fest at Beebee's place. The chairs and tables in the dining room had been moved and the room was full of residents in their wheelchairs. They were playing games and my kids jumped in line behind some of them. The prize for each game was not just a piece of candy but a bag of candy. I let the kids play all of the games and let's just say that the kids loaded up. Anderson's bucket was so full that he could not have put one more piece of candy in his bucket. Then it was time for the "Cake Roll"-that would be a cake walk for lots of wheelchair bound folks. Reagan invented that term! Well, when one Dennie won a snack cake then we had to keep playing until all of them won something. It was a good think that Keaton was playing because she was the winner 4 times. Each time she won, she would let a different sibling pick out what they wanted. After we all had won, then it was time for some food-punch, apples and caremel dip and smores dip. This of course made my people very happy. After eating a bit, then it was time to head back home. We were home for only a bit and then we loaded up again for GS Fest. The first stop was supper-the kids are doing the Book It program with Pizza Hut so the 4 big kids all earned their own personal pan pizza. This was a big hit and we all ate our supper in the car while watching the line form at GS Fest. It started sprinkling while we were in the car and we started to worry about the weather but thankfully the rain held off-at least until we left. The kids road quite a few rides-the entire time Whitman was on the roller coaster, he was shouting "stop, stop." Anderson and Reagan were the thrill seekers and rode one crazy ferris wheel ride that spun quite a bit. I even rode on some scrambler thing and gracious me, that will be my last ride for a while! Robby had already been on a spinny ride with the kids so it was my turn. Unfortunately, Graham and Campbell were just not quite tall enough to ride things without an adult. After the rides we moved on to the jumpies and then I had a snack from a booth from El Salvador. I am not sure what it was but it was tortilla filled with cheese and pork, only 2 dollars and it was delicious. I might just have one tomorrow if they are there in the rain. Of course my kids weren't too thrilled with leaving but when we pulled into McDonalds for a drink, ice cream and to share a few cookies everyone was thrilled again. We ate and then home for bed-busy day! This is the second day in a row that I was moving slowly this morning but the kids were not. The kids were quickly moving around getting dressed, doing chores (seriously, Graham was asking what his chores were before I had finished my cereal) and fixing their own breakfasts. Graham, Keaton and Whitman left this morning not to take Keaton to school but to run to Sams for a bit. This was Keaton's school day but she decided to skip since our homeschool buddies all came over. While they were gone, we worked on picking up this house and even did a bit of school. Soon after Robby and the kids arrived home, our guests started showing up and I was still making the kids lunch. Last night I asked them what they would eat other than sandwiches (I was trying to get out of making sandwiches) and someone suggested mac and cheese. Then someone else added that they wanted bacon in it and since I had both in the pantry, that is what I was busy making as our party got started. The Kamps, Heltz, Skinners, Stotts and Powells were all over and as Reagan said in a thank you note that she wrote after they left "it was so much fun." 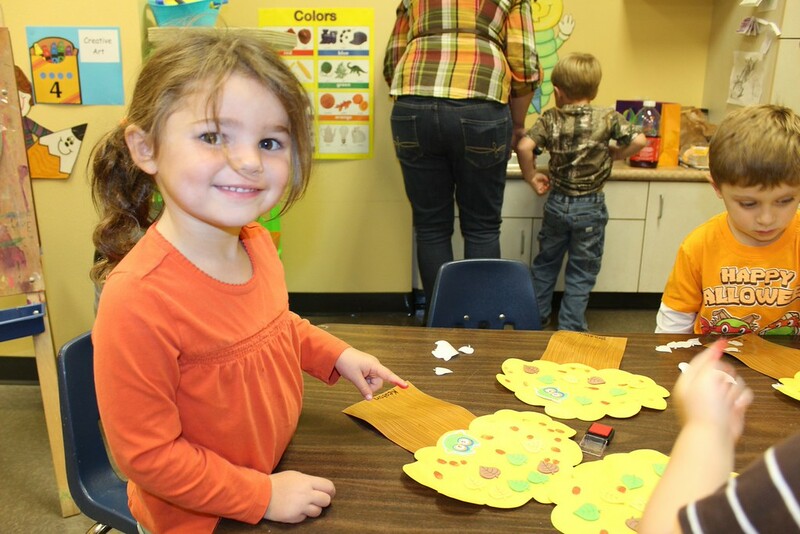 Our first activity was painting a fall tree and then Sara made a catapult with some of the bigger kids. There wasn't enough supplies for everyone to make one so I told Reagan that we would but the supplies and make one-but it looks like most everyone left theirs over here so we have plenty! 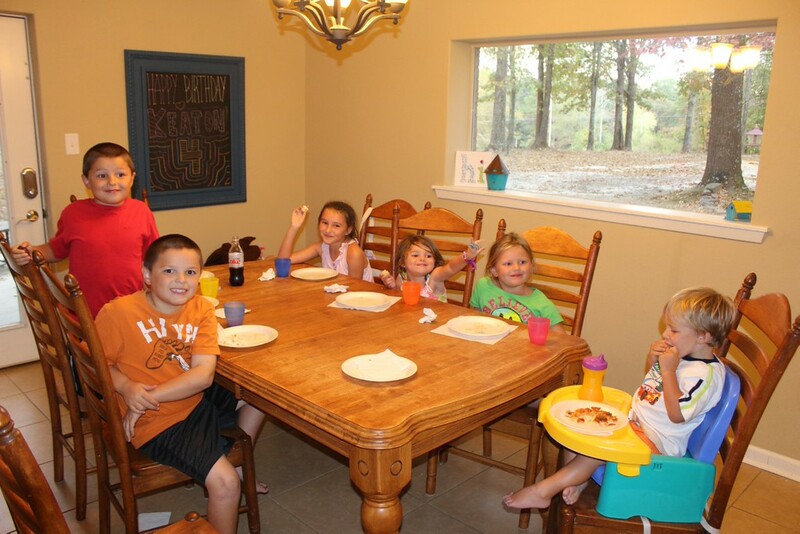 After the catapult, it was lunch time and we all ate lunch in the kitchen and on the patio-17 kids, 6 moms and Robby (who was working from home and hiding in his office)-that is a full house! After lunch, we worked on measuring and weighing our pumpkins. I had 2 different pages of pumpkin math-one of the little kids and one for the big ones. The little ones even had to see if their pumpkin would sink or float so that was a lot of fun-and my Whitman quickly spotted that water and dumped it over on himself. That helped the dirt stick better to him while he was in the dirt pile. Then it was time for a scavenger hunt-my little people took it more seriously than my big ones. All of the big kids marked that they found a feather but no one was able to show it to us. Interesting. Maybe they were too interested in the cupcakes that we had pulled out for a snack. Pretty much after the kids went outside into the wet, muddy and leafy yard, then we didn't let them back in the house. Whitman had at least 2 inches of dirt caked on his body-and that was what was under his clothes. The kids played and played during this beautiful day and had a great time. Everyone was gone by 3 and then we did what you do when everyone leaves your house-clean it back up! The kids all worked hard (well, Campbell did not and completely fell apart-she is my only kid though who will usually feel sorry for acting poorly and come to me and apologize while in tears) It didn't take too long and the house was back in order and the kids were all showered. Robby and I finished a picture album from our big trip and then we started on supper. The kids could not wait to finish their supper because afterwards was pumpkin carving time. Pretty much every year some Dennie is terrified of the pumpkin goo and this year was no different-We enjoyed torturing Whitman for a little bit and then got to work. This year, like last, we used the drill for one of the pumpkins and this was a big hit and then we carved some star wars something or another. Personally, I thought that Robby was a bit nuts pulling out a real something or another to carve and not just a scary face. It didn't take too long for us all to finish and then go outside to see our pumpkins lit up. Keaton was terrified outside with the lights off-she was worried about someone stealing our pumpkins and someone getting us. I tried my best to explain that no one was in the yard at all-I think she will be terrified when we go camping! After the pumpkin carving was over, it was time for bedtime and my people were tired, tired! And so was I! 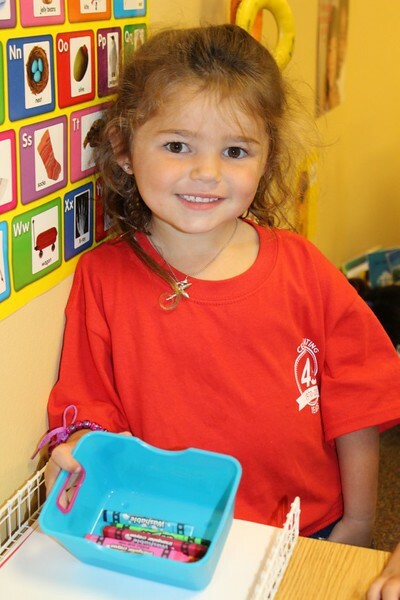 Today was school day for Keaton and as soon as she finished her yogurt and toast she was ready to go and see Ms. Jennifer. Today she had on a pumpkin shirt that had the date 2002 on it-not really sure where it came from but she sure was proud to show it off. The rest of us took a bit more time with breakfast and then started on school. The house stayed much straighter during the day since Keaton wasn't there but it still took until 12:20 to finish school. Then it was time for lunch followed by some reading. I am reading a Halloween book at lunch and parts of it were pretty spooky today so during chores, Graham thought he would scare me and sat a pumpkin on the couch with a baseball hat on its head. I caught on pretty quick but Whitman didn't seem to mind and accepted the pumpkin as another brother! The kids made spaghetti for supper during our chores and then we threw out all of our old candy-I really think that candy from last Halloween is a bit expired! And probably yucky too! I did let them keep 15 pieces but the had a hard time finding 15 that were still worth anything. 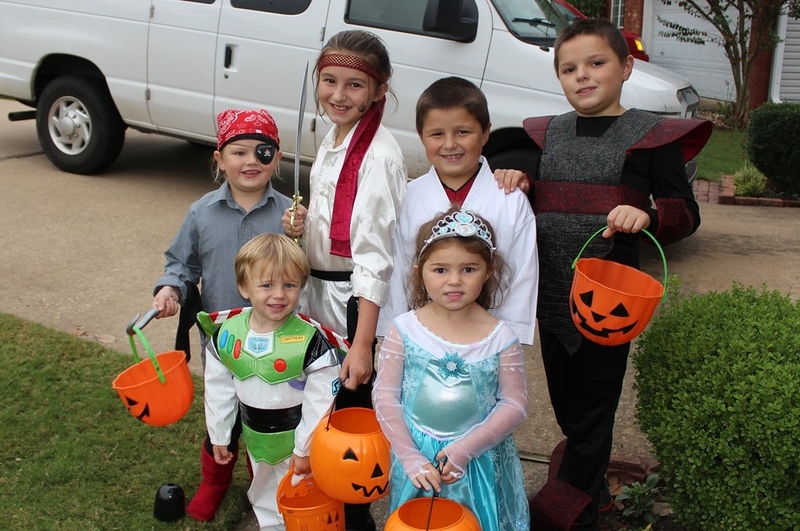 Sure hope the forecasted rain doesn't mess up their candy getting plans. This afternoon was spent with the kids playing and me switching out Anderson and Graham's clothes. The third time Campbell came upstairs she said "why aren't you finished by now?" Seriously? That child! I thought I was moving pretty swiftly but apparently not. Robby and Keaton came home and we had our spaghetti for supper before we went upstairs for work on our picture album from our big road trip-we are pretty far behind. The kids played the xbox, played a few board games and did a lot of roughhousing. They should have been tired but this will be the second time I have gone upstairs to encourage the girls to hush up! Wish me luck-or maybe I should say, wish them luck! Is there another way to eat cereal? Usually the kids all sleep well around here but not last night. We could hear someone talking in the girls room and when I was awake enough to understand what they were saying, I could hear someone asking if it was time to wake up. I started to wonder myself so I looked on my phone and saw that it was only 12:30. I went up there and calmed them down and just a bit later, I heard someone whining, then someone saying "what is wrong with you?" and then I heard the words "I'm scared." Now this conversation used to happen between Reagan and Campbell so when I went upstairs I walked right to Campbell's bed. I asked what was wrong and she said "Keaton is scared like I used to be." I brought her downstairs and laid her down beside our bed. Then after we slept for a while, Keaton started coughing and coughing and that child did not quit until I had given her a few sips of water. Finally, we were able to sleep for the rest of the night and not only did I have a hard time waking up, it was pretty hard for me to wake up the rest of the kids on this cool fall morning. We had our cereal for breakfast and then started on school. Mondays are always pretty hard days to get back into the swing of things but we survived and everyone finished school with fairly good attitudes. Notice how I tried to spin that in a positive light-seriously, we survived and everyone did finally finish their work and their chores. We do need to work on doing everything with excellence around here but the morning did go fine. We had our lunch and then it was time for our together work. After that Whitman took his nap while I worked on changing out his clothes. That is always a chore but one down and only 5 more to go! I finished that just in time to pass out the kids afternoon snack-apples, grapes, milk and some candy. Robby came home and then we had supper. The kids all had showers while Robby hung up some hat hooks in the boys closet and then the girls played a game or two before bedtime! "Why are the outside chairs in the yard?" was one of the first questions that we heard this morning. Oh, that was a simple answer-well, we saw a possum and it crawled into a tree while Robby was shooting at it with a bb gun. And the more he shot at that thing, the less it moved from its spot on the tree. He tried throwing rocks (that we had to get from inside the house since we have picked up all of them from that area of the yard) but unfortunately most of his rocks missed. The bbs still weren't scaring him away so he chunked some chairs at the possum but that possum was playing, well, he was playing possum and didn't move at all. What was I doing during all of this? Standing right by the kitchen door ready to run in and slam that door leaving Robby outside to fend for himself if need be-I did not plan to be supper for a possum or even a bear (they spotted one near her not to long ago) so that was also on my mind. We all made it into the house safely though. This morning the kids woke up and my boys voices were still pretty hoarse from all of the cheering on that they did yesterday. We all got ready for church and then headed that direction. We had time to check in with all of the grandparents before church started. Robby left after church with Whitman and Keaton so he could get lunch warm since Pops birthday dinner was our house today. Now, Pops wasn't feeling all that great but he managed to come for his party and I do think that seeing his favorite grands cheered him up a bit and made him feel better. We had a nap this afternoon-Robby had a harder time ignoring the kids and resting than I did. I was able to take a wonderful nap and think that I might even try again for another one next Sunday. Once we all woke up, it was time for church. After church tonight, Campbell looked at me and said "well, he just talked pretty much the entire time." Um, yep, that wasn't her first sermon to sit through. I don't know what she expected Patrick to do as he preached but talking was apparently not it at all. 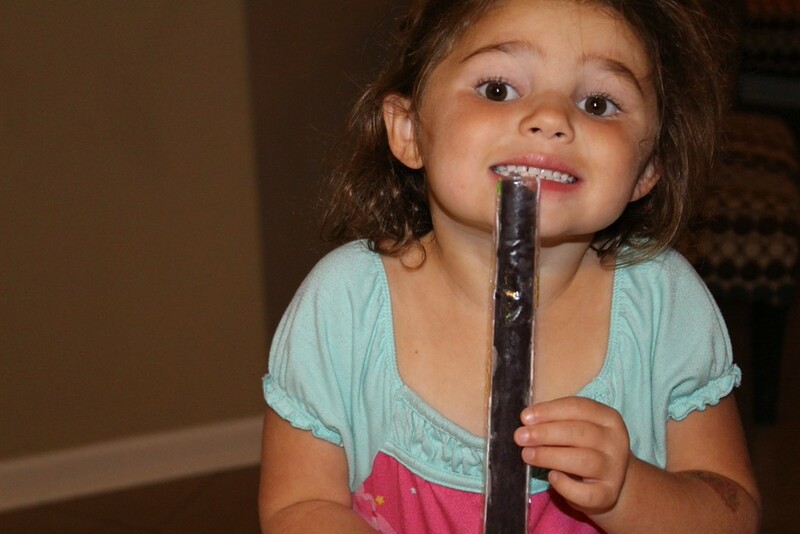 Once at home, we had a quick bite to eat and then ice cream truck arrived. The kids were still a bit tired from last night but hopefully they will wake up right at 7:15-not too early but not so late that I have to wake them up. First Game for the boys and 4 Overtimes! Late last night, the Wilsons called to ask if the boys and Robby would like to go to the game this morning. When Robby told the boys where they were going this morning, you could tell that they were both excited but Graham was the most excited. 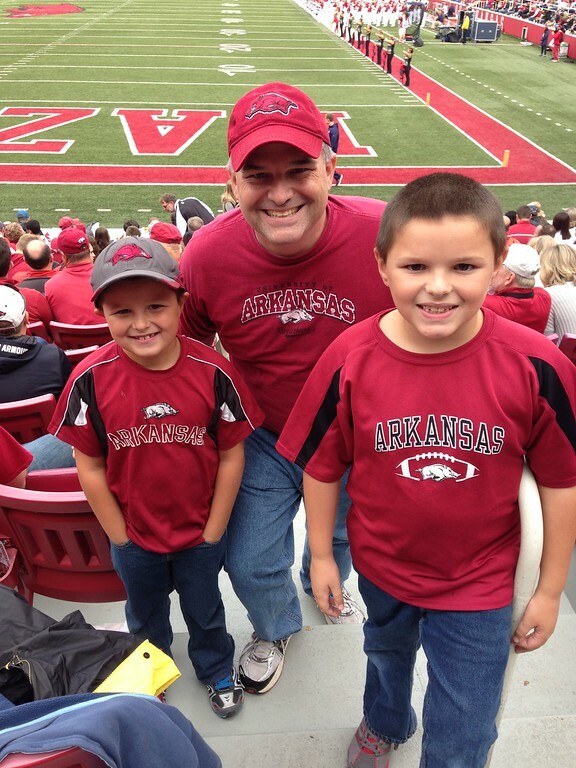 Around midnight, I went upstairs to pick out their clothes and saw that my Anderson was sound asleep but holding tightly to his Razorback hat. Robby woke me up right before he woke the boys up and I helped them get into their clothes and then saw them off. I realized that I needed to get a picture and went to get my camera-when I found the boys, they were sitting buckled in the car ready to go. I crawled back into bed and slept until the girls all joined me at 7:30. I was able to ignore them until 8:30 and then the girls wanted breakfast. I suggested cinnamon rolls but they wanted poptarts so I had certainly agreed. The girls were up early because today was going to be a good day for them too-ears pierced for Campbell and the night at Nonna and Pops' house for Reagan. We worked around the house a bit and then around ten left for the grocery store and then to the ear piercing place. I even offered for Keaton to pierce her ears and she replied with "never ever"-she even cried a bit worrying about Campbell. Campbell was super brave though she wanted to hold my hand. Two ladies did her ears at the same time so once they had marked her ears, it was over in a flash. And that is when my Campbell did not say a thing for a very long time-I thought that she was about to completely fall apart but she was fine and thrilled to show her new earrings off. Our next stop was Nonna's house for lunch. We ate over there and looked for the boys on tv. Robby said that the drive there wasn't bad and the rain was minimal. And the boys had a blast-he said they were so intent on watching everything and when they finally made it home (after eating supper in Fayetteville and ice cream in Conway) my boys were as hoarse as they could be. We left Reagan with Pops and they headed out along with Jason for a marathon shopping trip around town. Reagan managed to find a Christmas gift for herself and even eat out so I think that she had a good evening. Once we made ti home this afternoon, my girls got to work-they cooked with me for about 2 hours. They made Mexican casserole, made cheese dip, made rice, made beans and even made a chocolate cake. They worked and worked-overall they were a lot of help but I still think I could have done it quicker by myself but I sure would have been lonely. 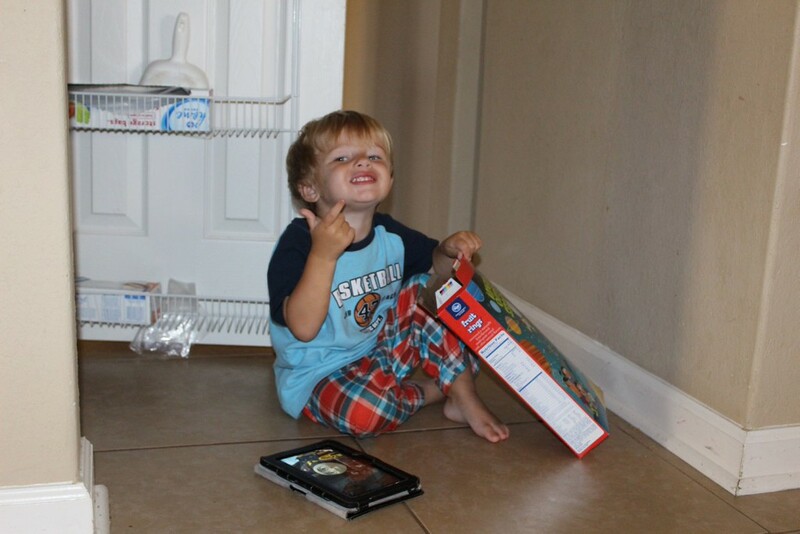 Whitman spent most of this time laying in the kitchen floor watching Thomas on the kindle and playing with his trains. Whitman eventually had a nap and the girls and I sat on the couch after the kitchen was clean. Then it was supper time and I had cooked enough-so we had crescent rolls filled with cinnamon and sugar or nutella. It probably wasn't the most nutritious of supper but it killed hunger. They asked for dessert but I said no since the other had been so sweet but when we were sent a picture of my boys eating Andy's custard, I had to pull out the ice cream for my crew! When the boys arrived home, they were showered and put to bed-they were still talking as I shut the door on them tonight. They were still so excited but I am sure that they will sleep pretty soundly after their big day! I think that my kiddos could have slept a bit longer this morning but alas school must be accomplished. The kids had their breakfast and then we started on school. This morning school was a bit crazier than usual but we were still moving along well. Near lunch, everyone had finished except Reagan who was still working when I started filling up the boxes for Monday's school. This is when things got excited-I discovered 2 days (4 pages) of math behind Anderson's school boxes. Hmm, this caused a dilemma for me-was this some type of freak accident that 2 days of math became dislodged and fell behind his drawers or was this done on purpose. I chose to believe the first-that is was just an accident. Surely the child is too smart to not do his math and hide them there, why not throw them away? Now to answer your question-the same one that Reagan and Robby asked me: don't you check his work? Yes, I do but the kids give me about 10 pages each a day of work and multiply that times 4 is easily overwhelming-overwhelming enough that I don't realize what is turned in apparently. Even though I gave Anderson the benefit of the doubt, he was not pleased with having to do his math. He claimed that he had no idea of what to do and had himself a good little fit. I was only making him do 2 pages and made it clear that the other page would be done this weekend. He flopped, he flailed, he cried, he screamed and he claimed that he couldn't find a quiet place in the house to work. I can probably agree with that-not finding a quiet place in the house to work. I suggested every room in the house but he quickly found a problem with everyone one of those room-he finally ended up working in the garage. And to that, I do not care as long as you get your work done. Yesterday, the kids all helped me make pasta salad for lunch this afternoon. They boiled the pasta, they cut the tomatoes, they cooked the bacon and they sliced the cheese- and they refused to eat it today! I knew it would be a stretch but goodness, I am sure they were starving tonight at supper. This afternoon flew by and I was scrambling around 3 trying to get everyone ready for the Fall party at the Nutrition center and then our get together at the Penningtons. Now, there is a reason that we tried on all of our Halloween costumes last week. The goal of laying everything out a week before was to make things run more smoothly and it would have worked-had half of my people not changed their costumes this afternoon. Seriously, that is 3 different costumes we had to pull out and throw on. Thankfully, we were able to leave at a decent time and I left with a pirate, ninja, Abe Lincoln, another pirate, Elsa and Buzz Lightyear. The Nutrition Center was fun and they had games for the kids to play, snacks and everyone was even able to make some slime. Robby had met us there and we followed each other to the Penningtons house. 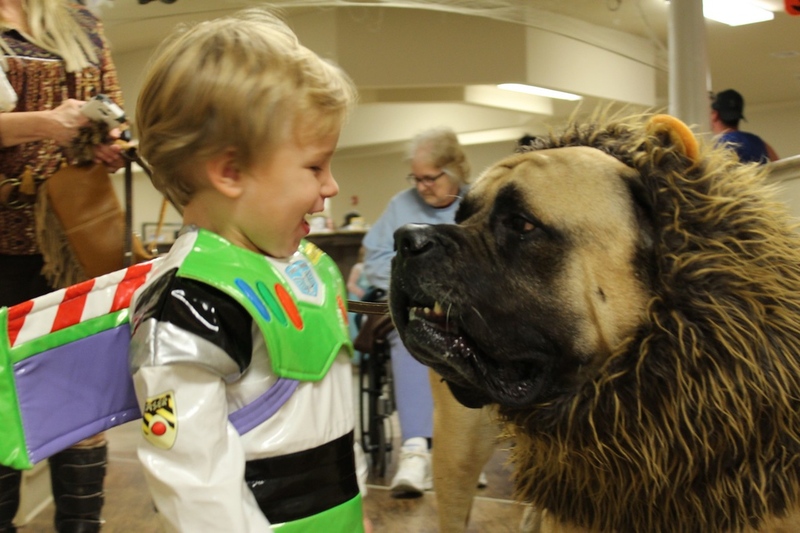 The kids were crazy excited about seeing their buddies in their Halloween costumes. After we took pictures, they played, ate, played some more, made a craft, played some more and April even sent over a picture of after we got home of her boys' bedroom with their mattresses off of the bed-I guess the kids really had a good time!...and maybe we should have watched them a bit more. Thursday morning and the boys of course were the first ones up but soon the girls were coming downstairs. Most of the kids ended up in bed with Robby for a few minutes before I started getting Keaton ready for school. She is always ready to go but today was her fall party so she couldn't get dressed fast enough. We had our breakfast and then saw Keaton and some of the crew off. Robby went since he was the driver and Whitman always goes on Thursdays to drop Keaton off. When Whitman is not here, we can really get school work done a bit quicker. The rest of the kids have to take turns to take Keaton and today was Reagan's turn. She was a bit worried about getting her school finished this morning but was still anxious to go. They had a big time-big time for my people means Sonic happy hour! And the rest of us were at home, working as fast and furious as we could. By the time they came home, Campbell was finished with school and I had finished working with the boys. Reagan jumped right in to her work and as soon as I had checked her math, I was out the door for Keaton's party. I hurried to church and they were eating their cookies. Keaton was so happy to see me and loved her party-especially the games and goodie bag. Once the party was over, we ran to Walgreens and then I dropped Keaton off for her Nonna day. They had lunch, took a walk, played baby dolls, made cookies and then came home. When I came home, I put up school and then we had lunch. After lunch, everyone helped pick up some and soon it was time for us to work together. The kids all worked on their crafts while we recited our memory work-Reagan and Campbell were making Halloween countdown chains, Graham was lego-ing and Anderson was playing with a sticker book. The afternoons always seem to fly by around here-I usually stay busy but can't really tell you what I did! After a while Robby did make our supper and we all ate. Then the evening was pretty much like the afternoon-lots of busyness but not a whole lot accomplished. Keaton and Reagan did work on her new legos and most everyone watched/helped and ate some of the rice krispy treats that Robby made and some folks had a shower. 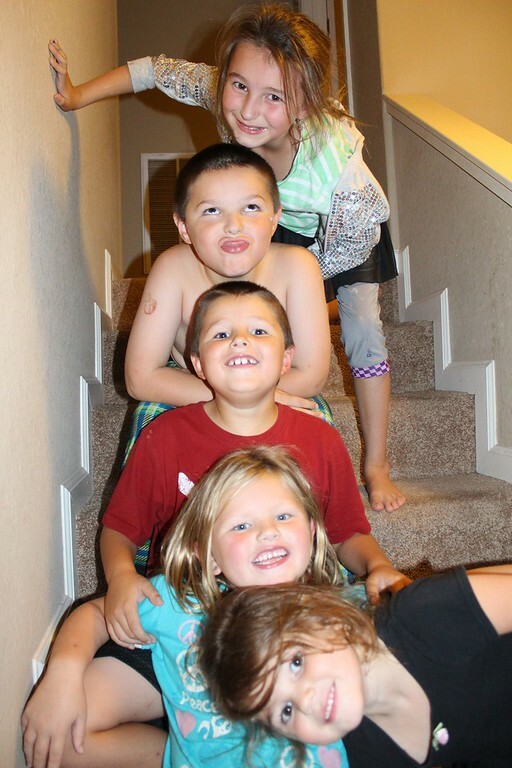 Tonights Bible study was about the Tower of Babel and then it was bedtime! And I don't think that I am too far behind them since my eyes are already getting heavy-hope the last part of the blog makes sense tonight! I served my treadmill time early this morning and hurried to be in my normal spot when the boys started waking up. I didn't make it to the kitchen in time and since I was in late last night from bunko, I am sure when they walked down the stairs and I was not right there they thought that I had yet to return home. Though they didn't seem overly concerned about my whereabouts nor did they seemed surprised to see me when I emerged from the bathroom. We had our breakfast and then Campbell, Keaton, Reagan and I started working on adding letters to Whitman's Thomas the train book. We worked until it was time to leave for Bible study. I tell you, I am so surprised how well Whitman has started going into his classrooms-all of them. It was just a few months ago that his teachers were having to pull him off of me. My group went to eat at a local church-St. something or another (I forgot which one it was!) They had a pavilion that we ate under and then the kids loved playing on the playground until time to go. We had already seen Beebee this week so we arrived home about an hour earlier than usual which was very, very nice. After unloading the car, we worked on our chores and then all of our together work. My boys were not too happy that we had to do our together work despite the piece of candy that I let them eat during this work. Really though, how could you not like that time of the day-laying in the floor with someone reading to you and candy in your mouth? I wouldn't mind that at all...except I would probably fall sound asleep if I wasn't the one reading out loud. Church tonight with a stop at the library on the way. 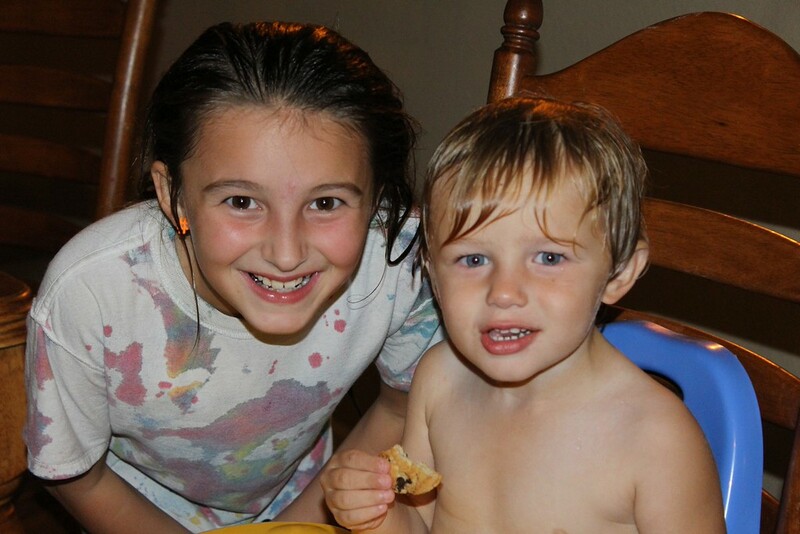 The kids all love Wednesday night and then home for showers and cookies before bed! 7:00 is the magic hour and that meant the boys were up and going. The girls weren't far behind and soon we were getting Keaton ready so she could head out for school. Keaton and Robby left for school and everyone dove into their school work. You never know who is going to the most focused for the day but today it was Graham and he was the first one done with all his school work. Grannymom and Grandpa picked up Keaton from school and they had an afternoon of fun outside was they planted some flowers for Grannymom, took Keaton's baby on a walk and enjoyed the great weather. Here at home, Whitman went down for an early nap since we had a big afternoon. Well, not that big, but taking 6 kids for their flu vaccines is no small matter around here. Soon we were waking Whitman up (so fast we forgot his shoes) and headed to All for Kids. Robby met us at the the clinic and we checked in and headed to the waiting room. There's just no way to be quiet with that many kids and toys to play with and fish to look at. They called us back and the nurse quickly sized us up. The plan was for everyone to get the mist vaccine except Anderson (due to his asthma). But since we didn't know how well Whitman could breathe in, we decided on the shot. He handled it like a champ. Two of the kids who will remain nameless (G & C) may have only gotten half their dose - they decided to breathe out instead of breathe in so we'll see how the flu season goes around here. With Robby at the clinic, that meant when were done he could take the kids and I could go shopping. (Well, first I had to go get my own flu shot at Target.) No serious shopping but I had promised the kids new pillows to go with their new beds plus trying to knock out a bit of Christmas shopping or at least stocking stuffers. Then I was off to Bunko for the night. Robby got everyone home and the boys headed off to play the Xbox, Whitman found the Kindle for Thomas and the girls all played with their dolls. 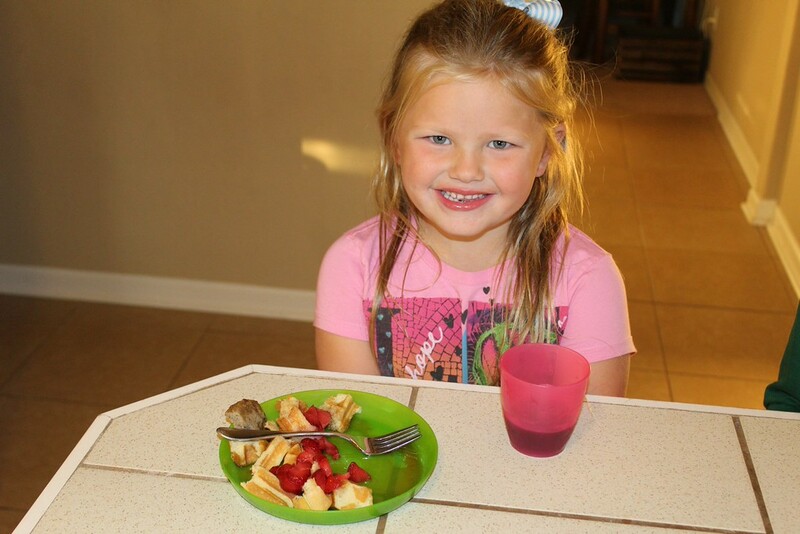 Robby fixed supper - a kid favorite around here: waffles with strawberries, whip cream, syrup and sausage. The Wilson's text about walking and Robby took them up on their offer so the kids could play and he could squeeze in a bit of exercising. The kids played and after the walking session, they headed home to get ready for bed and lights out. 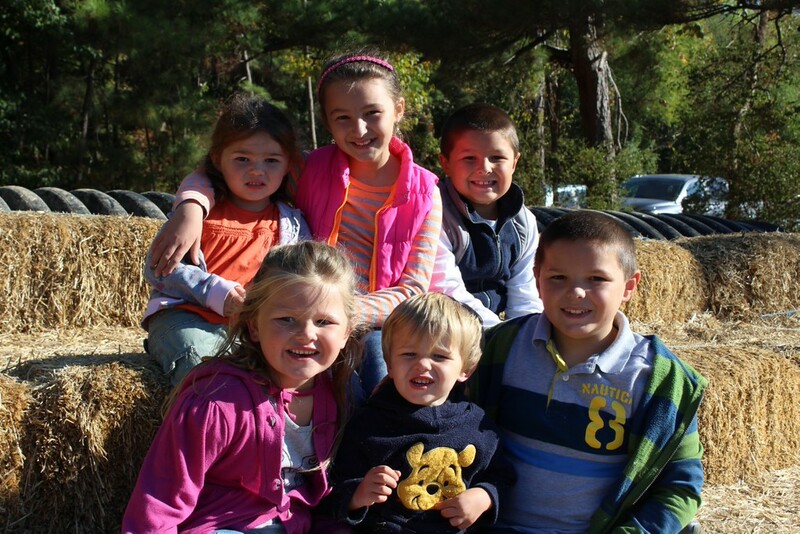 A visit to the pumpkin patch! The boys were up right at 7, walking downstairs in our chilly house only wearing their underwear. They sat right down at the kitchen table and started working on their few school boxes for the day. After Graham finished 2 of his 3, he looked at me and said that he was going back to bed. I said that was fine and he only had about 20 minutes until I woke him back up again. After a bit of time, I did have to go back upstairs and wake him up along with the girls. When I reminded the girls what we were going to do today, everyone was up and getting ready quickly. We had breakfast and the kids did some school work and a bit of our chores before we loaded up and headed off. Since the pumpkin patch outing would take us right near Beebee's place, we popped in on her early in the morning. The kids were much better behaved this week than last week and I guess that I was too-last week, I was the one getting into trouble! Beebee called my momma and told her that I was being to hard on those kids specifically Anderson and Campbell. In my defense, my children were acting a fool last week and needed more than a good talking to (which is what they got)-they needed to go out back and pick their switch! But this week, visiting Beebee when much smoother! As soon as we left there, we drove right the Mary's Place for our pumpkin patch. We arrived early because I didn't want to have to worry about parking and maybe because we were early or maybe because I was driving my big van but we got a great parking spot. The kids quickly found the petting area, the swings and the hay mound but the highlight for my big kids was the manual mechanical bull. We rode on the hay ride and my Whitman and Keaton took the gun shooting all in stride. They had a treehouse and wooden maze that the kids went on. And then back to pick out our pumpkins. Last year we all had little pumpkins but this year, the kids picked out giant ones. They are nicer but I am not sure I can cook them up to make Anderson his pumpkin bread. After leaving, we picked up lunch at McDonalds and ate on the way home. So when we came in, we immediately finished our chores and school work. The big chore today was going through my boxes of shoes to check and see if there were any winter shoes in there. The goal was to find Campbell black shoes and Whitman church shoes we did that plus some. Then Whitman went to bed and the rest of us did our together work-I know I always talk about our together work but here is what we did today: recited our verses (we have daily, every other day, day of the week and once a month verses), read a few pages of a short story book, read some of the sequel to Homer Price, read a chapter of a book about the climbers of Mt. Everest, recited the planets, sang the bones of the body, read a pumpkin book and sang the states and the capitals. We were going to recite some of our catechisms but Graham conveniently spilled them so he had to spend some time putting them back in order. Needless to say, this together work usually takes almost an hour and today we didn't even do our history or science reading. I keep those in another spot and forget to pull them out today. After all of this, the kids were tired so I told everyone that we were going to quiet and lay down for 30 minutes. I made it clear that they could read so they all did while I snoozed. They got a little noisy towards the end of the 30 minutes and I told them that we would try again tomorrow. I enjoyed my little nap! Then to the treadmill for me and the xbox for the boys and movies for the girls. Soon Robby was home and supper was ready. We had jambalaya and cornbread for supper along with ice cream which all ended up being a mess on the floor. The kids then had showers as we all picked up. The evening was fairly uneventful and then before we knew it, it was bedtime! We were a little out of practice getting up for a Sunday morning so our normally leisurely Sunday doughnuts became "grab a poptart on the way to the car" type of breakfast. All that mattered was that we made it to church on time with full tummies. Of course this did leave the house a wreck for our return home later in the afternoon. The kids did well in church-Campbell does so much better in the mornings than in the evenings. But she survived both services without having to be taken out so that is a good thing. We had a record for our third grade class-6 and this continues to be such a huge difference than the usual 16 from last year. Grannymom had made quiche for lunch and I do believe that it is one of my boys favorite meals. Whitman on the other hand was too busy climbing up and down the barstool for him to stop and eat-even his ice cream. The kids really wanted to go outside and today would have been a perfect day to play outside but Anderson was wearing a brand new pair of pants so nope, no outside today. Once at home, Robby and I tried to take a nap but the kids continued to interrupt. I believe that we both slept about 20 minutes and then that was about it. Campbell and Keaton eventually laid upstairs with me for a few minutes but by that time, my alarm was already ringing for me to get up. Church tonight and then home for ice cream truck. This is still a favorite of the kids-and a favorite of mine too since I am planning on my own ice cream truck to come in a few minutes! 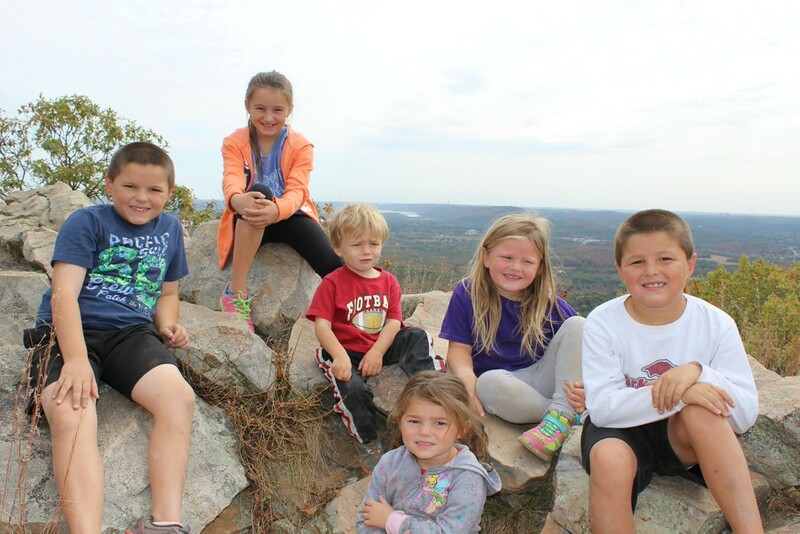 All the way to the top of Pinnacle Mountain! Last night Robby told the kids that we might possibly go to Pinnacle this morning. Of course after just mentioning the word "pinnacle" there was no turning back. It would have had to take a flood or fire for the kids to let us change our mind about going. I guess they were so excited about it that they had already talked about it early this morning. Because when Campbell laid down by us a bit after 7, she asked why we weren't getting up to go to Pinnacle. Robby was able to delay them by telling Keaton and Campbell to go and make cinnamon rolls. Those girls ran off to the garage to get the cans and then we could head them digging around pulling out the pans. I think it won't be too long until they will be able to make them all by themselves! After we all got ready this morning we headed out to Pinnacle. I had been wanting to climb it for a while and finally the weather was nice enough. We knew it would be a challenge with the 3 little ones but we made it. Campbell and Keaton were troopers. Keaton walked the entire thing by herself only holding our hands occasionally and Campbell rarely complained at all. Campbell was the most skittish one and would climb up a boulder to avoid walking on a smooth surface near a drop off and both girls never got upset after taking a fall or slide down the hill. Reagan, Anderson and Graham could have ran up the mountain. They politely waited for us every so often but we probably slowed them down. My Graham was a bit concerned about if we were going up the right way. And now Whitman-that little guy walked and walked. Towards the end he didn't want to hold our hands at all but of course a 2 year old running down the side of a mountain without holding someones hand is never a good idea. I held him some going up and down but Robby did most of the holding. For a while he even rode on Robby's shoulders. But overall, Whitman did lots walking and would slowly climb up those rocks. Once at the top the kids and us sat and enjoyed the view while taking a few pictures and having a snack. And then it was back down. Going down didn't take nearly as long but was probably a bit harder for the little ones. At the bottom we had a picnic and then the kids played on the playground for a while before we left. Our first stop after our climb was at Walmart-to buy Robby new sunglasses, Reagan new sunglasses and Graham new shoes. By the time we made it down the mountain the soles of the boys shoes were flip flopping off! Reagan and Graham ran in the store with me and we quickly found what we needed and walked out into the parking lot. I couldn't see Robby and the car anywhere. I did see a white van but it looked empty. At first I thought that Robby was out of the car changing Whitman or something but I couldn't see his feet. So still standing on the curb in front of the store, I again scanned the parking lot for our car-really, a 7 foot tall and 19 feet long white passenger van is usually easy to spot! But the only one I could see was that same empty van. So I decided that must be it and I just couldn't see Robby or any of the kids in it. We started walking and when we were half way there, I really looked again and I still couldn't see him. Very often he will drop me off and I will just run in a store and then pop back up, spot the van parked in the parking lot and walk right to it. Anyway, as Reagan, Graham and I were walking to the mystery van, I decided that I was not walking to the right car and stopped. It took me a second to dial Robby on my phone but as it started to ring, I turned around and we started walking back towards the store. The entire time I was scanning the parking lot looking for Robby. I had only walked a bit when I heard Robby shout my name. I turned and saw him sitting in the mystery van. Apparently he had reclined his seat while waiting on me and I couldn't see him sitting there. All he heard was Campbell say "there's Momma" and then a few seconds later, he heard her shout "she's turning around!" Oh, what a commotion I caused in that car! After all of this, Robby kept me near him in the next store so I didn't get lost! All of us went into the store and we did some major shopping-our receipt was as tall as Keaton and possibly Campbell. We had an hour to unload our groceries before heading to the Wilson's house for supper. 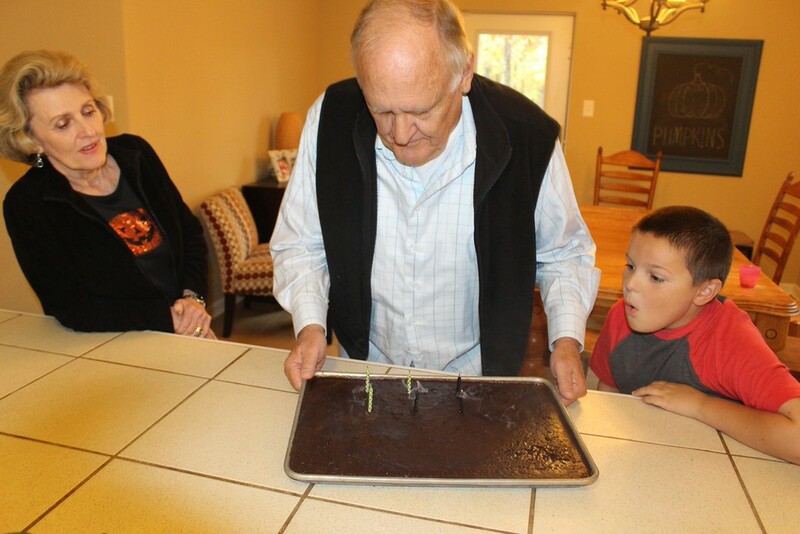 Shannon had chili and delicious brownies to celebrate Robby and Keaton's birthdays. They even had a present for Keaton. She was delighted with her loot and spent most of the rest of the evening putting on her lip gloss. The boys played the xbox and ate for most of the night with Whitman playing with his trains and eating popcorn. We stayed out way too late and came home to shower the kids for church and then to bed! Climbing a mountain is hard work! 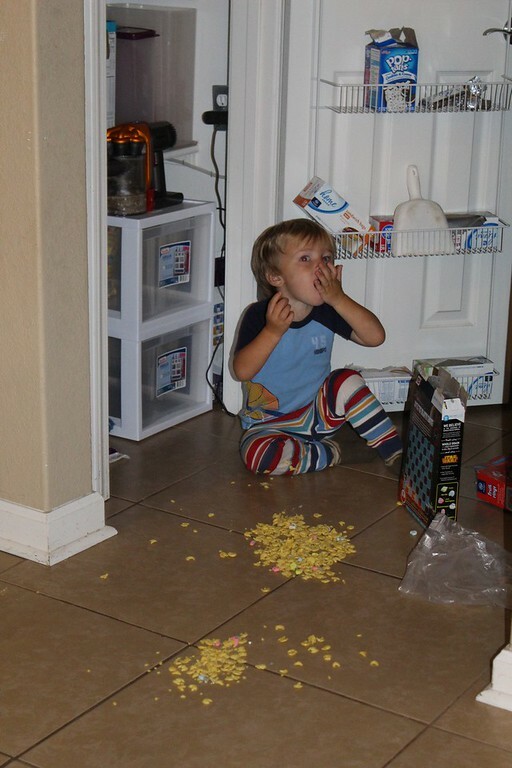 Look who found the cereal! Even though Campbell had helped me make banana bread muffins yesterday she had no intention at all of eating them this morning for breakfast. I said that was fine but offered up no other choices. I finally did relent and tell them that after they tried their muffins they could have some cereal as well. So my girls tried their muffins and sure enjoyed putting butter on them. Then I looked over and saw Reagan glaring at me-she was NOT going to eat a banana muffin. Even though she had eaten pumpkin bread the day before, she was not trying this. So she just sat and watched while the others ate and then when they all had a little bowl of cereal to top of their breakfast, she also had one. Gracious me! After Robby left we started on school and the one thing that I find amazing is that the days that Keaton is home, the house is just trashed by the end of the school day. I have no idea what the difference is when she is home or why Whitman and Campbell do not make such a mess when Keaton is not home. Thankfully, I had plenty of time between working with each kid this morning to straighten. I had just about finished the downstairs when the clock struck 12 and I started feeling like I should start on lunch. After lunch, we did our chores and then started work on our Christmas Child boxes and then even picked out Halloween costumes. I am a bit bummed since I couldn't get Reagan or Campbell to dress as a pirate-but as long as they are happy and as long as I do not have to buy anything! The boys played on the xbox again for a bit this afternoon while the girls watched movies. And pretty early in the evening, we all loaded up to head to Grannymom's house. Since we were out of town and they were out of town, we haven't seen them in a few weeks. I wasn't up as early this morning as I have been other days this week but I still up before the kiddos. I know that if we went to real school, they would already be on their way to school by the time they have to wake up. But I still hate to wake them up every morning and what frustrates me is that I know on Saturday when we can all sleep late, they will all wake up early! As soon as wake Anderson up each morning. he scurried down the stairs and up the stairs to go and play with the legos. That is all that boy can think of-playing legos. I do think that is a pretty good hobby though so even if I have to call him for breakfast a zillion times, I don't mind. After school, we had lunch and then cleaned up. Then Campbell and I worked on making some banana bread-3 recipes of banana bread. This morning I grabbed my last loaf of bread from the freezer and at lunch Anderson was beyond himself with excitement that it wasn't banana bread as I had thought but it was pumpkin bread. During Whitman's nap, we did our together work and our science talked about Noah and the floor along with rainbows which is what we have been talking about at night time as well. Then we played 2 games before the boys went upstairs to play on the xbox. I was on the treadmill while the played and it was pretty funny. Graham was so animated-he would scream, groan, yell, jump, flail, clap and holler at his team and Anderson was pretty stoic and would occasionally walk around with his chest all puffed out. They were pretty evenly matched but Graham ended up beating Anderson during second overtime. While I was on the treadmill, I would cheer and boo each team until Anderson finally asked "who are you rooting for?" When Robby came home, we loaded up and went to Nonna's house to celebrate Jason's belated birthday. Pops made hamburgers and Nonna had all of the fixings. 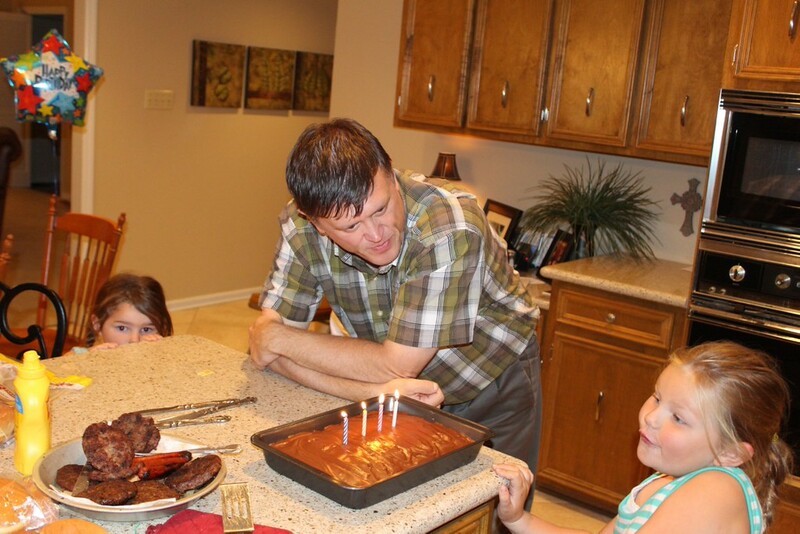 Supper was good and everyone enjoyed the cake and ice cream after Jason blew out his candles. Once at home, it was time for showers since the kids had played outside at Nonna's house. On the way home, Robby said that he wished that we had 6 shower stalls right beside each other-that sure would make showers a lot easier! Decades Night at 3:16 Live! Bible study morning and I do believe that the kids could have slept a bit longer today. I did let them snooze until almost 7:20 before going upstairs to wake everyone up. Everyone helped with their chore before we had our breakfast and then it was back to Bible study. Everyone was happy to see their friends and my Whitman still walked happily right into his class. When I picked him up today he was very pleased to tell me that he played on the playground. After Bible study, we went to the park with our buddies. The kids had their lunch and then they all walked around on the trail-at one point, we the moms looked up and couldn't really see any of our kids. They were all just behind the trees playing. Later we heard that they were playing "1900s"-what a bunch of homeschool dorks! After lunch, we ran by Dana's to pick up a costume for Reagan and then on to see Beebee. She was happy to see everyone and they told her all about their trip. Whitman mostly just talked about her candy and shoved candy in his mouth the entire time that we were there. Once at home, the boys and then Reagan and then Campbell went outside to rake some leaves. The boys did work hard and asked if they could earn a kindle game so in a moment of weakness, I obliged. This is what caused the girls to go out and work and even though Reagan worked pretty hard by herself, her pile wasn't as big as the boys and Campbell's pile wasn't really a pile at all. I did make sure that the kids understood that this would be their last reward for raking leaves because we will all work together to finish that job later this year! The afternoon flew by and soon we were getting ready for tonight. 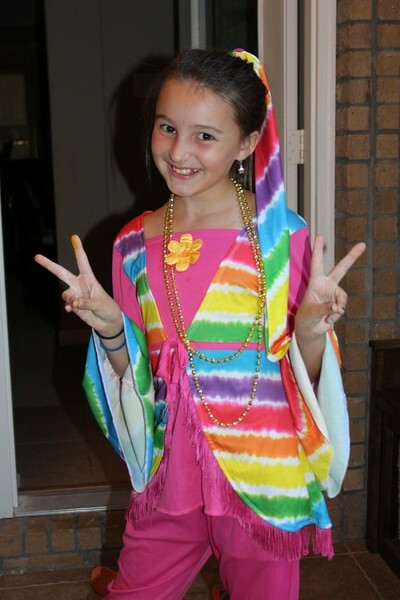 The little kids were to dress as their favorite Bible character tonight at church. They all dressed as Samuel and wore their pajamas. The big kids had decades night so Reagan wore a 70s costume and the boys dressed as men from the 50s. While walking into church, I had almost convinced Reagan that it might not have been Decades night! She was just about to be mortified that she was all dressed up on the wrong night-she soon caught on and was relieved. After church, we had a snack and then it was bedtime-Wednesdays are a long, long day! Open House at Keaton's School! I guess it is truly fall-when I woke up this morning it was still really dark outside and then tonight it was chilly, chilly and to top it all off, I even have apple cider in the fridge. Keaton was ready to go to school this morning but no one else was. We had our breakfast and then started to work-I thought things were going to go really, really well...but I was wrong, wrong! Reagan was almost as distracted as the boys were today. I had never seen anything like it. I would tell them to do their work and then 2 minutes later, they would be wrestling, playing with Whitman or doing anything that didn't have to do with math or writing. It was just plain ridiculous but I stayed calm and just made it clear that no one would watch tv or pick up their kindles until all school work was finished. I thought this might help the kids help each other out by being quiet-probably didn't work. At 11:30, I told the boys to gather what school work they had left and to take it to Robby's office because he was coming home and they could finish their work with him. Robby was picking up Keaton from school today and I thought that he was staying here for the rest of the afternoon (I was wrong and he was actually headed back to work). The boys went nuts-they gathered their school work, they started picking up and then they set in and flew through that work. When Keaton did arrive home, we ate and then worked on our chores and gathered clothes for tomorrow. Then afterwards, we all did our together work along with science and history. I told the kids that I was going to walk on the treadmill and they would have to finish their work. The boys ended upstairs with me since they had yet to start when I went upstairs and this helped them some but goodness, gracious. I do believe that I am going to have to buy shock collars for them to wear during school-just give them a buzz when they stop working. Around 5, I started looking for supper when Robby text and asked about going out to eat for supper. I certainly took him up on that since I didn't think that I had any food other than a sandwich to eat! 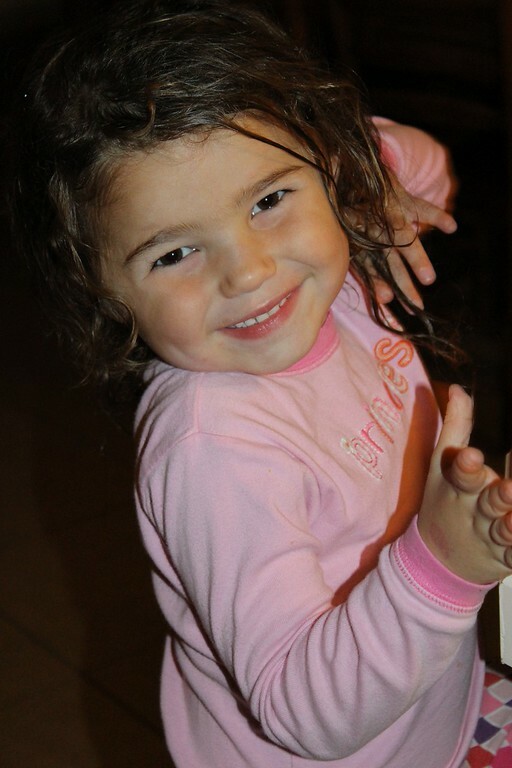 We ended up at David's Burgers and after a bit Nonna and Pops showed up and then Keaton's friend Evelyn arrived. We tried to talk the Wilsons out of walking but still ended up walking 3 miles tonight. The kids didn't even bat an eye when we walked out the door and Whitman was still in pretty much the same spot that we left him when we returned-though he didn't have on a diaper! Once at home, it was shower time and then bedtime for the crew. Tomorrow is a busy day around-back to Bible study. As soon as the clock turned to 7, Graham started telling Anderson “it is seven, it is seven.” What in the world? I think I need to start giving him some Benedryl before bed each night. But that wouldn’t have mattered either because moments later, Keaton climbed in our bed. I laid by her until I had to go to the bathroom. I hoped that Whitman was still asleep but as soon as I walked in there, he started passing me his toys ready to wake up. It didn’t take too long for us to go downstairs for breakfast. Every hotel breakfast, I really want a bagel with cream cheese but when we are at a Holiday Inn Express, there is no way that I can pass up one of their cinnamon rolls. Tomorrow I will have to reintroduce myself to the treadmill. Since we were in Tupelo last night, I knew that we didn’t have too much time in the car and I better pull out the cookie butter from Trader’s Joes. We all had cookies and delicious cookie butter as we headed back into our home state. We stopped once for gas, once to pick up a movie and another time at a rest stop. The rest stop was the favorite of the kids because the grass was like a golf course and they loved rolling all over it and playing some tackle football in that soft grass. The movie stop was my favorite because we picked up Cinderella and I listened to it as the kids watched while I drove us all of the way home. Once we made it to Little Rock, we stopped at Nonna and Pops’ house. Anderson’s souvenir had been sent to their house and he was more than ready to pick it up. Then we had one last stop before making it home (2,467 miles later) - icees at the gas station near the house. We had told the kids that we would get slushies yesterday but we ran out of 7-11 stores before we realized it and then told them they could get something today. That is probably what caused Campbell to ask “what are we going to do special today?” I do believe that my little people are pretty spoiled. We had supper tonight and then Jason came over for a few minutes to play with the kids. Campbell and Keaton dressed as princesses and made bracelets while Jason was here. They all enjoyed seeing him and when he left, it was bedtime for all my people. Robby said that he could have gone to bed too that early but we still have at least one more load of laundry to fold! Eating Good at The Varsity! We had planned to wake up at 7 this morning but the kids were still sleeping which made it pretty hard for us to wake up. Anderson had already climbed in our bed and going from a double bed at the Disney house to a king at this motel-we hardly noticed him. While Robby was getting ready, I opened the balcony doors and everyone started waking up. Campbell, though, woke up in a bad mood crying for me to close the windows! But on the other side of the room, I heard a door opening and closing along with some giggling. I then found Whitman standing up in his pack n play opening and closing the door to the bathroom. For the last two nights, his pack n play has been shoved into the bathroom. When it was time for us to put him in bed, I would have to squeeze through the 5 inches that we could get the door open with his bed in the bathroom and then Robby would have to hand me all of Whitman’s necessities-trains, pillow, Sully, Snoopy and some milk. Then Robby would carefully squeeze Whitman through the opening and once he was laid down, we would have to close the door while pulling the bed towards the door so the toilet would not be pushing into the side of the bed. The things we do so we can all get a good night’s sleep. Once we did load up the car, we headed out...except we couldn’t head out at all! There was a car parked right behind us and even though Robby inched forwards and backwards for a while, we still were getting nowhere (literally and figuratively). Thankfully, when he went in to ask, it was a workers car and they were able to move their car with out us waiting too much longer. We have just about done everything that we could instead of heading the towards home. I was beginning to think that Robby had no intentions of going home Monday or even anytime next week. The first stop was at McDonalds to pick up breakfast for us all. This was our first McDonalds breakfast on the trip and the kids were very excited about this. Who wouldn’t be excited about pancakes, sausage, biscuits, potato cake and eggs. I divided those breakfasts up and the kids dug in. My Whitman wasn’t a real fan of breakfast but he held his breakfast in his lap until we stopped and whenever Graham tried to grab a bite, Whitman would holler at him. I jumped out at a roadside attraction to check on pecans but they were still a bit pricey. I plan to go and gather some this year so I decided that I could wait. Then we have never been to a Trader Joes store and had recently heard people talking about it. It was a fun little stop with lots of neat little groceries to buy. We picked up a few things but the most exciting part was the cookies and cookie butter which was planned to be our snack later in the day but we ran out of time...there is always tomorrow. We had to drive a little bit out of our way for that stop so what was a few more miles to drive through the Jacksonville Beach area. We walked down a fishing pier. Unfortunately, we didn’t see anyone catch any fish but we did see someone catch a bird. Robby ushered us all on along just in case something not so pretty was to happen next to the poor bird. The pier walk was a pretty walk but I am afraid that it just made Reagan more upset about having to go home. She desperately wanted to return to the beach this morning and could not understand why we just couldn’t be gone for one more day. Anderson told her over and over that Daddy had to go back to work and we had to come home. His motives are not all that pure-he knows that he has a lego set waiting on him at Nonna’s house and is anxious to pick that up. Back in the car, we passed out another drink to wash their snack of popcorn from last night’s food tour down. Then it was listening to church for Robby and I with headphones on and I really have no idea what the kids said or did during that time...I do believe I love those headphones. I am still wearing them now as I lay down to go to sleep. After listening to church, we flew on down the road. We only had to stop at one rest stop for some football and a potty break and then at a gas station for another potty break...and there might have been another potty break somewhere in between. Of course the traffic near Atlanta really started to pick up and then it started to crawl and the kids, by this time during the day, had become pretty antsy and noisy. We finally made it to the Varsity and everyone was starving. Most everyone had hot dogs and Robby and I ate hamburgers along with a fried apple pie, an orange shake and a chocolate shake. 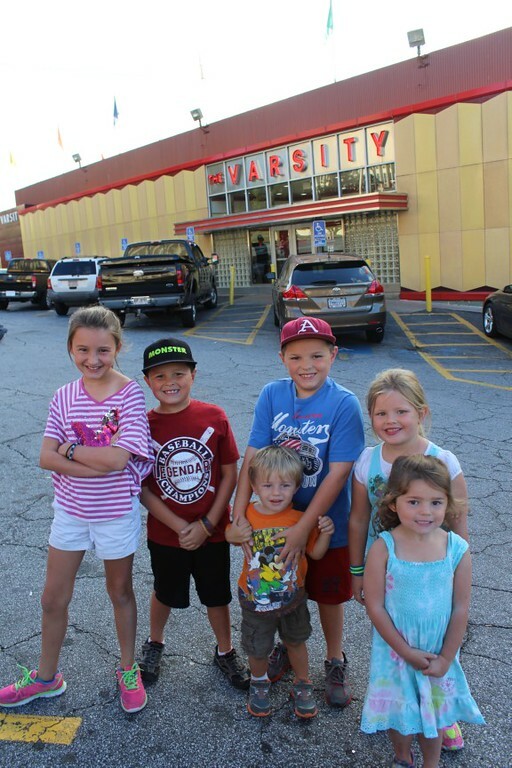 To top it all off we ended the evening at the Varsity with ice cream for all of the kids. Then it was on the road again...right into more traffic. Early in the day we had chosen a hotel that would be a bit further of a drive tonight but help us out tremendously tomorrow. We probably should have thrown in Atlanta traffic and a few potty stops into our hotel eta. The ride to the hotel was smooth but there were a few bumps in the road...we had 2 kids sleeping, had exhausted our selection of movies (not really but we had had enough) and the car was a pretty quiet. This is when Robby found some music to listen to. Whitman heard the first little bit and shouted out “I no like this!” We ignored him but as Robby’s Gaithers continued to play, Whitman shouted again “I no like this!” Sorry, Pops. I guess this one isn’t a Gaithers fan. Once those Gaithers became a bit too slow to listen to late at night, we turned it to Prestonwood music and that really upset the boy. Apparently he has a thing against Christian music. “I no like that! I no like this!” over and over we heard as Robby and I sang along. Maybe he was upset over our singing! Most everyone snoozed on the way to the hotel. They were a pretty tired bunch tonight but hopefully everyone will sleep well. We didn't stop any after supper which greatly helped with our time and everyone was bedded down by 11:40.